In Romania, he averaged. 14.3 Pts per game while shooting (52% from 2pts range and 40 % from 3pts range. He also shot 82.5% from the free throw line and averaged and 5.3 rebounds in his last season in Bucharest. Nyakundi graduated from Southern Methodist University in 2012. In his last season at SMU, he was the team captain and led the team in scoring at 14.8 points per game with a field goal percetage of 46.8%. He finished his SMU career as the second best 3-point shooter ever at the school. The versatile Nyakundi played at positions 2,3 and 4 while in Romania. His first season as a professional (2012-2013) was abbreviated by a injury which required surgery. As a result he missed the playoffs. 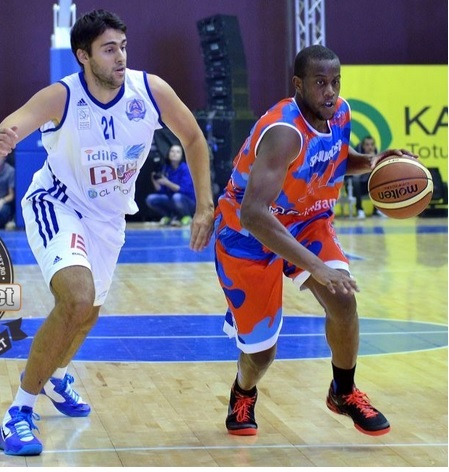 Last season he also played 6 games in EuroChallenge where his averqged were 10.8ppg and 2.7rpg. Besides Nyakundi, Liege also signed Boris Penninck, John Fields and , Jerime Anderson. This entry was posted in Kenya Basketball News and commentary, Kenya Basketball Players, Kenya Sports news and commentary and tagged Kenya basketball, kenya basketball players, Robert Nyakundi. Bookmark the permalink.